This could be your view if you're out and about in the car tomorrow, with rain and even snow forecast for much of the country. Forecasters have warned of treacherous driving conditions for Easter holidaymakers, with snow and torrential rain on the way. A yellow snow alert has been issued for parts of northern England and Scotland on Easter Monday. More than 100 flood alerts and seven flood warnings were in place across England today. The Met Office said there is a chance of delays on roads, with some stranded vehicles, along with disruption to rail and air travel. And it could get worse tomorrow, with snow forecast in places - especially on higher ground. 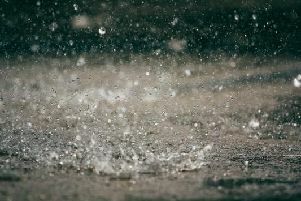 Met Office forecaster Helen Roberts said: "The main risk is rain, we have a number of warnings out at the moment, including a fairly large rain warning covering most of the country. "It is going to cause problems for people travelling on Monday - there will be a lot of surface water on roads. "Further north there is a snow risk overnight on Sunday, with snow and sleet across the moors of England and hills and mountains of wales." Some rural communities could become cut off, mainly across the northern Pennines and Scottish Borders, with "significant accumulations" and up to 10cm of snow forecast. "There could be some disruption in the north. Further south it will be more of a transient feature and not much settling on the roads," Ms Roberts added. The AA warned motorists to take extra care and said the bank holiday weekend is "likely to be one of the busiest on the roads in recent years". The Met Office forecast for the North East is for a mostly dry, chilly start to the night, but cloud will thicken, with rain, sleet and snow spreading north through the early hours. The minimum temperature will be -1°C. Tomorrow will see a mix of rain, sleet and snow continuing, with snow accumulating across hills. It will turn to rain at all levels through the late afternoon and evening, clearing north overnight. The maximum temperature will be 5°C. It will be much milder on Tuesday and Wednesday, with rain or showers, perhaps heavy and thundery, with the odd sunny spell. Thursday will probably be drier, although showers are still possible, with breezy winds.